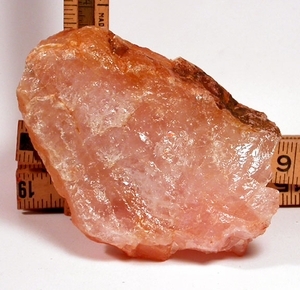 A naturally sliced, baked ham pink South Dakota rose quartz rough with regrowth, rainbows and jaunty self-display. Need a grounding focus for working on your issues? Need a gift for your gruff guy? Here you are! It's 1-1/2x 2-3/4x 4" tall with lovely translucence and succulent color range.